NEW YORK, July 18, 2012 – Global Finance magazine has released its rankings for the World's Best Project & Infrastructure Finance Providers to be published in an exclusive survey in the September 2012 issue. As countries seek to improve their global competitiveness, project finance is an important source of long-term financing in emerging markets, as well as developed economies. These awards recognize the growing significance of investments in core infrastructure assets such as airports, railways, ports, power generation and transmission, oil and gas pipelines and renewables. The OECD estimates that $53 trillion of investment will be needed to meet demand for infrastructure improvements through 2030. Global Finance selected winners across ten global and seven regional categories. 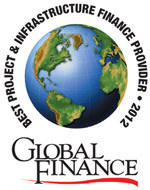 Global Finance 's editorial team – with input from industry analysts, bankers, lawyers and technology experts – selected the best providers of project and infrastructure financing and services. A variety of subjective and objective criteria were used for choosing the winners. Factors considered included market share and position on league tables, innovative products and thinking, client service, execution skills and vision for the future. "There are many exciting projects underway or on the drawing boards, despite difficult economic and financial conditions in many parts of the world," says Joseph Giarraputo, publisher of Global Finance . "Those who take advantage of current low construction costs and changing technology to invest in infrastructure will be the winners to come in the years ahead. Productivity and efficiency need to increase to promote economic growth and meet the future needs of the world's expanding population." An Awards Ceremony for all winners will be conducted during the World Bank/IMF Meetings on the morning of Saturday, October 13, 2012 at the Foreign Correspondents' Club in Tokyo, Japan. Most Innovative Strategy for Infrastructure Development (State/Province or Municipality): New York City’s Economic Development Corporation for Cornell NYC Tech (“Silicon Island”). Most Innovative Strategy for Infrastructure Development (State/Province or Municipality): City of Copenhagen’s North Harbor.